I was googling expanded polystyrene (typically known as “styrofoam”) food packaging bans the other day searching for a list of all the cities in the US that had banned polystyrene (aka PS). I was having quite a tough time finding the answer (though I eventually did… as any persistent googler does). As a result, I wanted to draw up a quick post with the findings. Enjoy! There are 100+ total polystyrene bans across cities in the US. 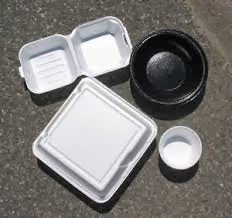 I’ve listed most of the major cities & counties with polystyrene bans below along with reference links to either the ordinances themselves or articles on the bans. The “effective date” for the ban is also provided. Most of the full bans are for polystyrene food ware (e.g., to go containers) and force restaurants and businesses to use recycled plastic or compostable alternatives (awesome!) to cut down on trash and landfilling. The partial bans typically ban the use of styrofoam at any city owned building or event. If we’re missing any cities or counties, let us know!